I didn’t really expect the Super Bowl to be a high scoring game. What I saw of the Rams against the Cowboys and in glowing columns written here and there about Sean McVay’s genius suggested to me that he’d simply built a thorough, modern, and well executed version of the old Mike Shanahan offense. I have a suspicion that much of the praise of McVay has more to do with a hope that he can save the jobs of coaches from that coaching tree and skill set from being replaced by spread-savvy teachers. The LA Rams are big on 11 personnel (one RB, one TE, three WRs) but they like to use the flexible nature of that scheme to boost their wide zone-based offense. Their WRs often line up in the box and block and their goal seems to be to lure you into playing with smaller personnel so they can run you over, then when you start hurrying to the line after the snap to stop the run game they have an extensive play-action package. When I watched the Cowboys play this team they kept getting their wires crossed by the complementary nature of the Ram run and pass game and they ended up getting gashed. 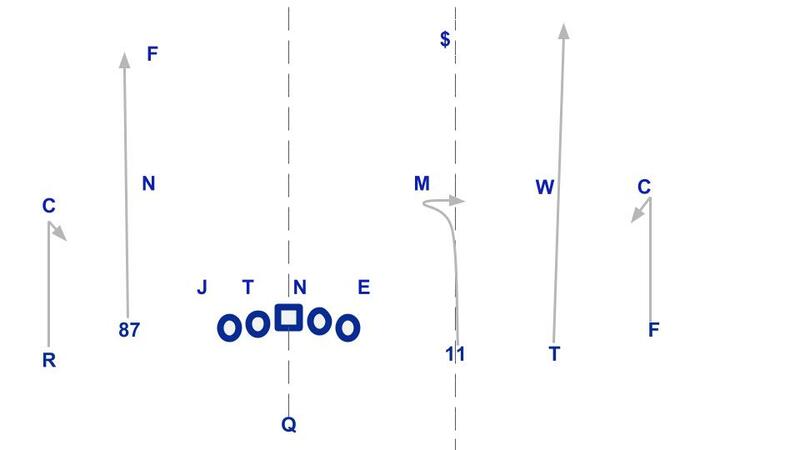 The “wide zone” or “outside zone” run blocking scheme is one in which OL get going laterally and look to reach play side defenders with their initial footwork, the defense is stretched laterally trying to maintain their gap fits and then the OL start shoving guys laterally and creating creases for the RB to hit on cutbacks. It’s a chemistry-intensive blocking scheme that works best with quicker OL and a RB who will do his job. The Shanahan Denver Broncos were famous for rolling in RB after RB with virtually no reputation and turning them into 1k-yard backs. McVay accomplished something similar with CJ Anderson, who the Rams picked up out of nowhere to essentially replace (injured?) Todd Gurley for the playoffs. The Houston Texans had a good thing going with this scheme back in the day with Arian Foster, then they decided to prioritize paying him rather than the OL and it all fell apart. The Rams should pay attention and let Gurley walk. The challenge facing the Patriots was how to stop the Rams’ lethal wide zone scheme without overcommitting the DBs or giving up mid-level patterns when run action sucked in the LBs. McVay’s young QB Jared Goff threw for 4688 yards at 8.4 ypa with 32 TDs this season, carving up teams for the manner in which they’d try to overplay Gurley and the run game. It was obvious to me that Bill Belichick would try to scheme up his front to handle the Ram run game honestly without overcommitting the secondary. Very often when you face a team that breaks you down with a holistic system in which every dimension plays off the others, if you can beat one of their features honestly it throws a monkey wrench in the whole thing. For instance, the Art Briles Baylor Bears were designed to create maximum stress to every area of the field with a vertical, option route passing game, wide splits and perimeter screens, and then a downhill run game that often featured a lead blocker. If you backed up to stop the pass game they’d hammer you underneath with lead runs and screens, if you committed everyone to the line of scrimmage they’d pick a matchup and throw it over the top. But if you could stop the run with fewer defenders or stop the pass without playing two-deep? Then the Bears didn’t know what to do. The Patriots played a lot of nickel package in this game. The nickel was 5-11/215 pound Patrick Chung who related to the TE in coverage and would play the edge and box in runs to the TE side. On the weakside they had 6-3/250 pound Kyle Van Noy who had the same responsibility on the weakside save for avoiding any duties to cover anyone unless the RB slipped out. Then 6-3/260 pound Donta Hightower would play the middle from depth and track the steps of the RB. The LB deployment was key, with Chung and Van Noy playing in tight and boxing in runs that freed up the DL to shoot gaps. Quick penetration murders the wide zone scheme because it eliminates the potential horizontal and forces the RB to cutback into predictable lanes that the D can close on. Hightower would hang back to clean up in those predictable lanes and the safeties would arrive as well with time to diagnose the play. The Pats had three TFLs on the game and the Rams ran for 62 yards at 3.4 ypc. On the back end the Patriots carefully matched up with guys that could play match or man coverage on all of the Rams’ WRs. In the nickel package they played Jonathon Jones as the SS helping Van Noy with the slot WR. When they played dime Jones would drop down to play tighter and JC Jackson would come in as well while Chung (or later Duron Harmon) moved back to play over the top, his size and physicality in the box no longer required. The Pats kept Stephen Gilmore matched up on Brandin Cooks and Devin McCourty stayed back and to play over the top on specific WRs or tendencies per Belichik’s instructions. Beyond that, the Patriots also brought a ton of five-man pressures, which is Belichik’s preference against OL that he doesn’t think highly of in terms of their ability in pass protection. With five-man pressure you get 1-on-1 matchups on every OL and obviously that’s trouble for shaky lines. The Patriots had four sacks in this game, two by Donta Hightower. If you recall, the Patriots played nickel and dime and matched up carefully against the Chiefs with McCourty staying over the top of Tyreek Hill and the Chiefs had nothing until they started catching Van Noy and Hightower with the RBs. The Rams didn’t have that dimension to their offense and Goff wasn’t up for beating the Patriot DBs in man coverage. You can look back and attribute most all of the six Belichik/Tom Brady Super Bowl rings to the years in which they had really good DB play, particularly at corner. When Belichik has a lockdown corner, he can scheme to take away strengths and undermine offensive systems. For the first two championships in 2001 and 2003 they had Ty Law at CB, in 2004 they lost him during the season to injury but were able to plug in Asante Samuel and ride out the year. The 2004 Patriots also had Rodney Harrison and Eugene Wilson at DB to help cover things up and one of their better Os led by “clock killing Corey Dillon” who had 1600 rushing yards. Then Law left in free agency and the Patriots struggled to make the most of several potent offenses until 2014 when they had Darrelle Revis on a one year deal and took down Seattle. Then they opted not to franchise him for $20 mill and their new tandem of Logan Ryan and Malcolm Butler held up alright and then broke through with huge seasons in 2016 when they won another title. Then in 2017 they lost Ryan and brought in Stephen Gilmore in free agency. They famously benched Malcolm Butler for the Super Bowl and lost a shootout against the Eagles. This year they had Gilmore and McCourty’s twin brother along with a deeper stable of DBs they’ve been developing. In the Super Bowl alone they played at least eight DBs and had a few different nickel and dime packages to try and use to match up against the Rams’ skill players. Their goal in general seems to be to protect Hightower and Van Noy to focus on traditional LB roles like playing the run, beating blocks, and blitzing without the concern of getting caught in space covering someone 30 pounds lighter. The Rams went another direction with their roster development, hoping to win thanks to the pairing of DPOY Aaron Donald and the addition of Ndamukong Suh to help free Donald to push the pocket from DT. That worked out pretty well but they couldn’t stop Brady from connecting with Julian Edelman for 141 yards on 12 targets (11.8 ypt) and the Patriot’s low scoring output had a lot to do with the Rams’ kicking game and not just their D.
The Pats’ leading pass-rusher in 2018/19 was DE Trey Flowers, who had 7.5 sacks. Belichik doesn’t worry about beating you with a single dominant pass-rusher, he’ll manufacture pressure by moving guys around to attack matchups and make sure his secondary is clamping down on your preferred routes and targets. As I’ve noted repeatedly, as fast as good offenses can get the ball out on offense, your pass-rushers are irrelevant if you don’t have the players and schemes on the back end to force a QB to cycle through the OODA loop AFTER the snap. New England had four sacks to LA’s one because the Pats were able to force Goff to hold the ball while Tom Brady is notoriously difficult to confuse and the ball gets out insanely quickly in the New England offense. Wade Phillips had some solutions, often peeling DEs to stop the Patriots’ RBs out of the backfield, but they couldn’t cover Edelman nor the occasional throwback Gronk play. The Patriots are going to need adjust eventually and either stop playing two 250 pound LBs or else support them in dime if they want to avoid teams using pass-catching RBs to torch them. Against run-centric, 11 personnel though? They dominated. Michigan had similar success this past year with similar tactics up until they played a team that wasn’t run-centric and that they couldn’t match up against and then they totally unraveled. The big story out now is how brilliant the Patriots are for bringing back 21 personnel (two RBs, one generally a FB, and a TE) and plowing a smaller defense. Lots of folks are convinced that the answer to smaller defenses designed to stop the spread is going to be big, mauling offenses. This is nonsense, of course. The Patriots scored 13 points in this game and had to bail themselves out of trouble against the Chiefs by spreading them out and hitting them with Edelman and Gronk. The reason the Patriots had to get bigger and more run oriented was that their key players are really old and beat up. Gronk is too beat up after taking shots for the last decade across the large surface area that his 6-7 frame presents to opponents. Brady doesn’t need to risk taking shots in the pocket trying to throw it 40+ a game either. The Pats also lacked weapons in the passing game to force opponents to worry about. If a team loaded up the middle of the field then Gronk wasn’t quite up for stretching the field anymore and the Pats didn’t have WRs outside that could punish 1-on-1s, especially sans Josh Gordon. The way they eventually cracked the code against the Rams D was to get into bigger personnel to run the ball only to spread the Rams back out so they could manipulate the matchups. These are standard HUNH spread tactics but the use of those formations from bigger personnel that could present a running threat really messed up the Rams’ defensive structure. 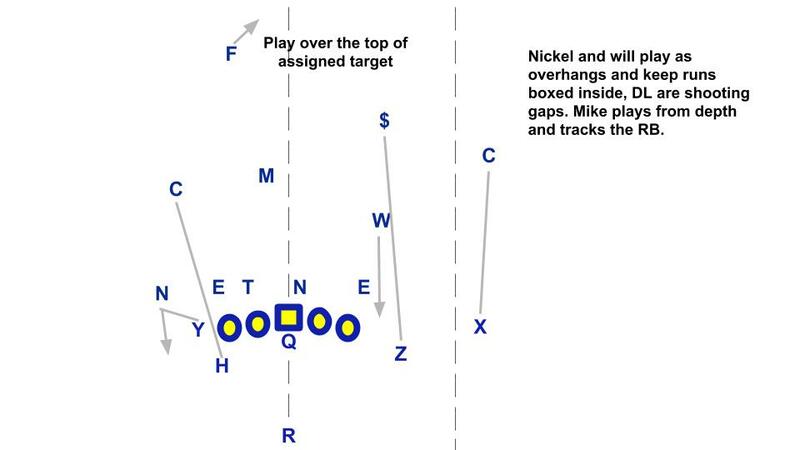 Again, the Michigan Wolverines have used these tactics to great effect at the college level but they’ve lacked QBs that can punish defenses with good presnap reads and quick throws. The Texas Longhorns also blasted teams last year with hybrid 11 personnel. The set up they used was going empty with a FB and two TEs, then they’d flex out EVERYONE but position Edelman and Gronk inside where they’d either draw the weakest of the Rams’ run stopping personnel or else the Rams would have to flex out big LBs and risk getting run over inside. This concept, Hoss Y-Juke, is the pinnacle of ball control/spread-iso football. The RB and FB are flexed out and matched up against cornerbacks. Then the big TEs are lined up against coverage guys with lesser ball skills and you get oodles of space in the middle of the field for Edelman to work against a middle linebacker. Necessarily the defense has to adjust by dropping a safety to help, leaving open the possibility of a slot fade to a guy like Gronk. You can see the Rams picking their poison from snap to snap. First they got torched by Edelman on the juke route. Then they double Edelman and Brady hits the comeback outside on the flexed out RB for easy yardage. They double Edelman again and lock in tighter everywhere and Brady goes over the top with the slot fade to Gronk. This is the future of football that I’ve been detailing for the last few years, often picking examples from the HS ranks. Fielding hybrids and then spreading out the D so they can be punished for whichever way they choose to try and match up. This is comparable to the rockets’ strategy of surrounding Harden with shooters and then letting him play iso ball on a chosen defender. You can’t defend this with run stoppers that can’t play coverage or move around in space. The offense can always use motion to get you into predictable coverages based off the dilemmas they cause with matchups. If the rams had used these spread-iso tricks to isolate Van Noy and Hightower in space they could have won the game but their RBs and system aren’t designed to work that way. Instead they are still trying to make the most of the wide zone scheme in a run-centric system. Overall this was yet another game where a coach with a knack for strategy over a particular system won the day. That’s why Belichik and Greg Popovich have such staying power, they accumulate versatile players and use strategy to allow their strengths to dominate a game. Spread-iso ball is the best way to achieve that result and it’s going to continue to take down the alternatives. Despite my almost complete lack of care for NFL football, I think was one of your better articles. Well done. Maybe they would have done that more if it weren’t for Gurley’s mysterious injury or whatever was going on there. Looking forward to the 2019, 20, and 21 seasons for Texas with lots of hybrids and QB reads.